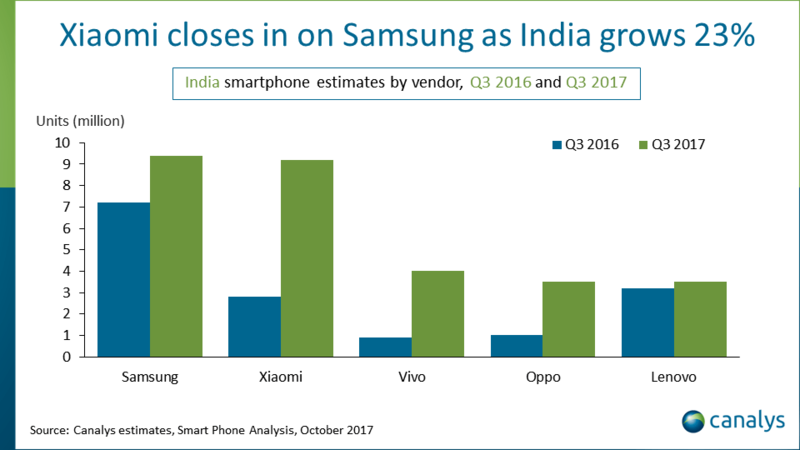 Last week, the research company Canalys revealed that India has become the second-largest smartphone market in the world after China based on Q3 smartphone shipment data. With 23% year-on-year growth to 40MM unit shipments, India displaced the United States for the #2 position in terms of sales. But the country has 300MM smartphone owners, which already made it a bigger smartphone ecosystem than the US, and with about 1BN Indians yet to own a smartphone, the market has plenty of room to grow. Despite the incredible size of the smartphone-owning population in India, the market generally hasn’t been interesting to Western app developers until recently. Mobile data had historically been very expensive in India: many users kept mobile data usage nearly-permanently turned off, only using data-intensive applications with wifi coverage. 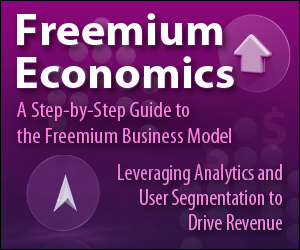 This use pattern renders streaming services more or less irrelevant in the country and generally makes IAP-based economics unworkable. But mobile data prices in India have been falling rapidly since early 2016. 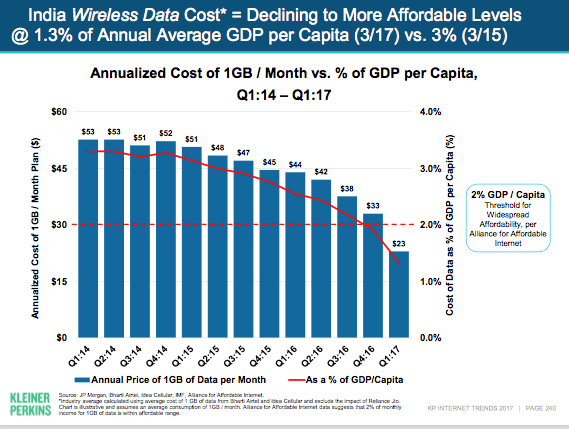 In her most recent annual internet trends report, Mary Meeker pointed out that wireless data prices (for 1GB of data in a month) have fallen below the 2% of GDP per Capita threshold that is considered to be the tipping point for widespread affordability. The catalyst for the drop in mobile-specific data prices was the price war initiated by India’s Reliance Jio, which forced the hands of competing companies (Airtel, Vodafone, Idea, and the state-owned BSNL) to also decrease prices. 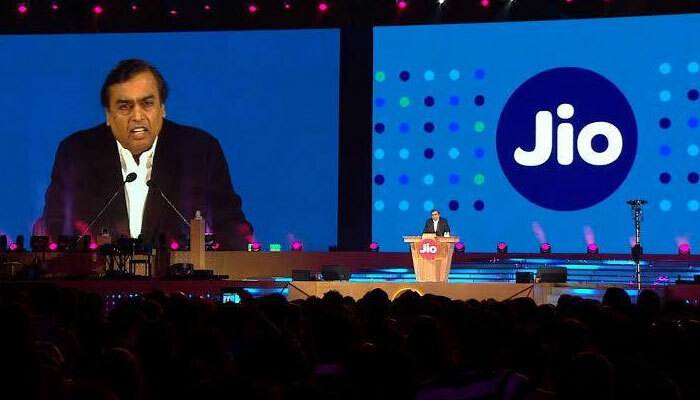 According to Mukesh Ambani, the chairman of Reliance Industry’s parent company, Reliance Jio customers now consume nearly as much data as all mobile users in the United States. Another reason for the growth in smartphone sales (and growing interest in India from both investors and developers) is the increasing prevalence of mid-range smartphone hardware that can access functionality that provides real utility to users (like smooth, real-time access to the phone’s GPS, or the creation of photo filters, or streaming video, etc.). Android’s first attempt to penetrate India with its portfolio of services, Android One, failed partly due to a focus on the extreme low-end of the device spectrum. The makeup of hardware sales in India is seeing increasing advancement from China’s Xiaomi, which counts affordable, mid-range smartphone hardware as one of its primary strengths. But Apple, too, has made inroads in India recently, doubling its iPhone sales year-over-year to nearly 1MM units in Q3 2017. Many of these sales are of older models: over half of all iPhone sales in India in 2016 were of models that weren’t the most recent. The last big hurdle for Western app developers in India is payments infrastructure, but this too seems to be progressing at an impressive clip. 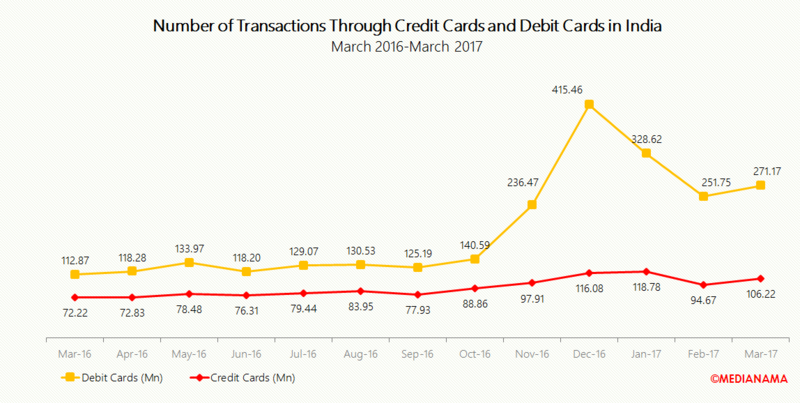 While cash is still king in the country, debit card transaction in India grew by 140% year-on-year in March 2017. 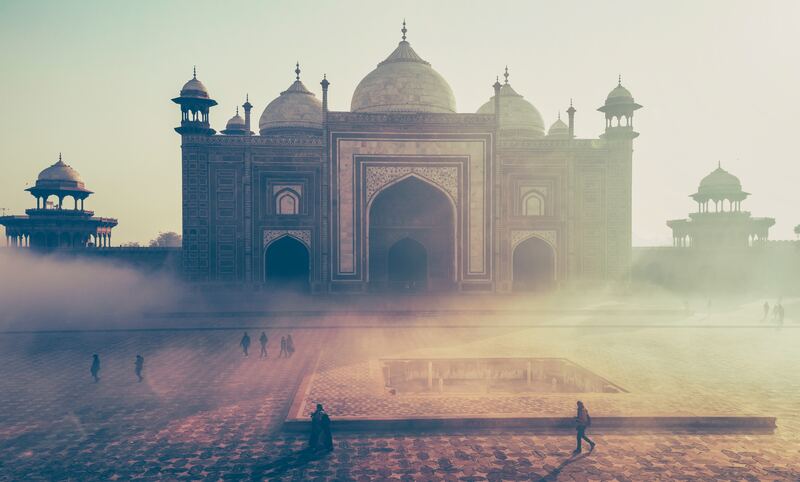 And in September, Google debuted Tez in India, a bank-linked mobile wallet for both iOS and Android that facilitates retail transactions, online payments, and person-to-person exchanges of money via Audio QR. India’s government has been active in trying to move the country away from a cash-based economy, incentivizing the development of a fintech sector and even using policy to curb cash transactions: in November 2016, the Modi government demonetized the country’s existing 500 and 1000 Rupi notes in an attempt to fight tax evasion and the funding of terrorism. And fintech more broadly is booming in India as the country transitions to digital banking and payments. On sum, despite some fundamental problems (such as localization: about 30 languages are spoken by at least 1MM people in India), the Indian app economy is becoming an ever more attractive market for Western developers looking to reach audiences beyond the hotly-contested high-ARPDAU regions.